I have no other means of describing this recipe other than “stupid good.” I am kicking myself for not making more of it, because it was so phenomenal. I’ve seen some gnocchi mac and cheese recipes before, but this one is a definite Pink Troll Kitchen/Danielle Kay original! 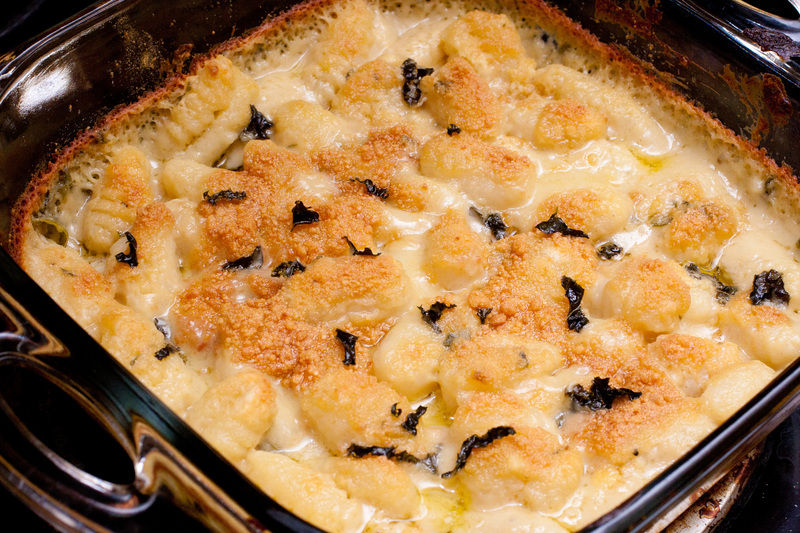 Basil and white cheddar together are just so great, and when you add in gnocchi, one of my favorite foods (which I finally found a gluten-free version of a couple weeks ago), you’ve got yourself some magic food. 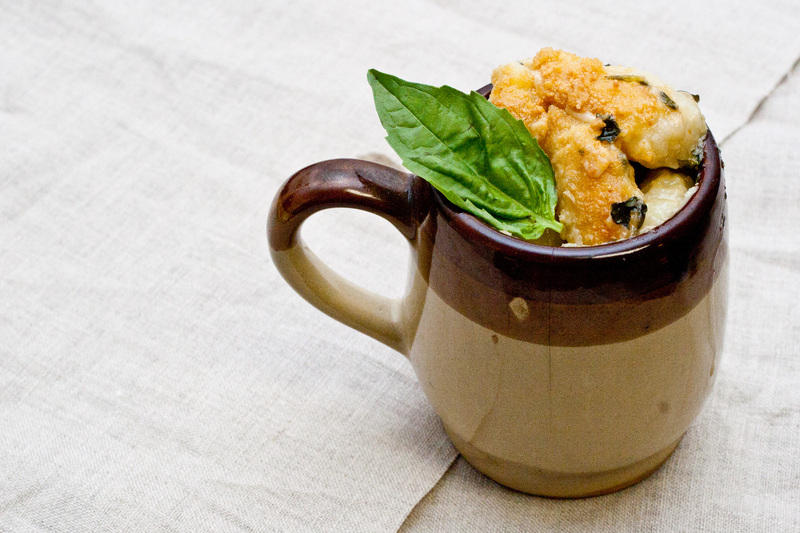 Plus the fact that you have some basil pesto taste in there…just wow. I’ve got nothing else to say besides eat up! 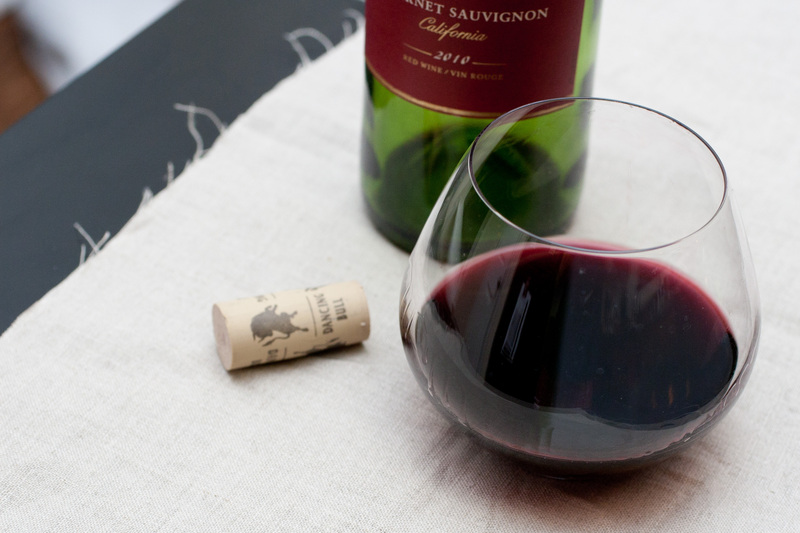 First, pour yourself a glass of your favorite wine. This might be the most important step in cooking a delicious meal. Preheat oven to 400 degress. Cook gnocchi according to directions on package. Drop into boiling salted water and stir lightly until gnocchi rise to the top of the pot. Drain and set aside. Add 1 clove of minced garlic and 1 tbsp of olive oil to saucepan over medium heat. After 1-2 minutes, add flour and stir to make a paste. Add milk and stir regularly until thick. Add in your freshly shredded white cheddar and 3 tbsp of the parmesan to the sauce and mix well until melted. 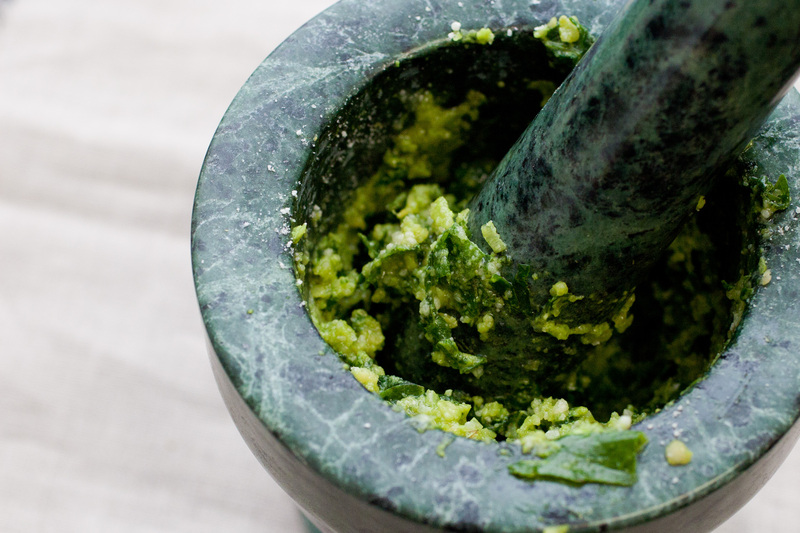 With a mortar & pestle (yes, we’re doing this old school today) grind basil, 1 clove of garlic, and pine nuts into a rough paste. Add rest of parmesan and 1 tbsp of olive oil. Continue to grind until well mixed. You don’t want this pesto to be overly smooth…you’ll want those big bites of flavor. 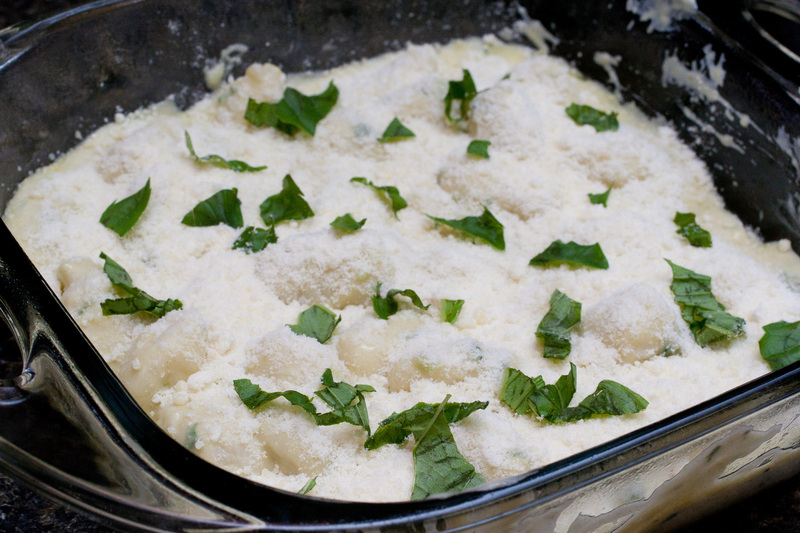 Mix gnocchi with sauce and pour into 8 x 8 glass baking dish, lightly greased. Top with parmesan cheese and a few extra pieces of basil. Bake at 400 for 30-35 minutes, or until cheese is brown and bubbly. Let sit for 10-15 minutes in order to set up. 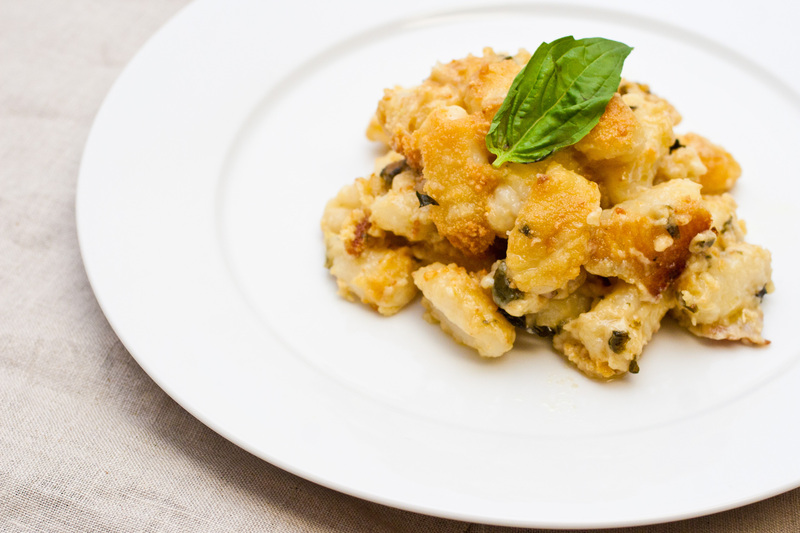 Scoop onto a plate, garnish with some additional fresh basil, and enjoy!